Walking up to the Alara Permaculture Forest Garden feels at first like leaving behind the bright shining lights of N1C – the alluring new post code of King' Cross and St Pancras. Past the imposing iron gateway to Camley Street Nature Park, the industrial hinterland of the station dominates the views, with warehouses and their corrugated roofs lining the road after it winds through a tunnel, on and up with no signs of a garden anywhere. But it was definitely worth the walk. As I approached the Alara Permaculture Forest Garden a cheerful crowd had already gathered and they were wassailing strong. The noise hit you first – loud reverberating clangs by a troupe of people with tin trays and wooden sticks, banging them for all they were worth around a fruit orchard, planted on a neighbouring warehouse site. 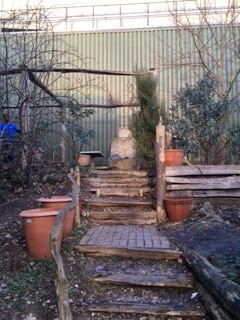 A green man had been beautifully created to adorn the entrance to the Alara Permaculture Garden. Wassailing is said to be experiencing a revival and, judging by the numbers who turned out for this wassail party, it is certainly popular. Created in Somerset from medieval and pagan traditions, it is intended to wake up the fruit trees from their winter slumber and ward off any evil spirits. “Sap rise up and bring forth fruit” they sang to the trees in Kings Cross, making three forays in all during the evening to two small orchards, tucked in to spare land by the warehouses, and to the main garden. There was lots to eat and lots to keep the large, local crowd amused. They assembled around a roaring fire of old pallets and were offered face embellishment (face painting for adults, I think), mulled cider, roast hog, salads and beer, as well as live music for the night. The food and fun was provided free by a variety of local businesses which Alex Smith, founder of the Alara Permaculture Forest Garden, has brought together into a new venture called the Camley Street Community Project. They include the London Orchard Project, a partner of Alara, IMS of Smithfield, Daily Fish Supplies, Pip Organic, and the Camden Town Brewery. The main garden has been painstakingly created from a sliver of land between the warehouses and the railway tracks. Alex led his staff and volunteers in the removal of about 50 tons of rubbish and it took them four months of digging out Japanese knotweed before planting could begin. 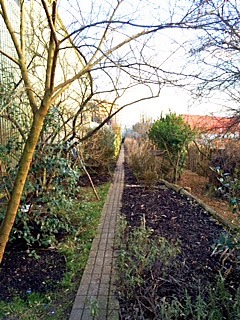 The permaculture forest garden is now well established and edible plants and fruit trees co-exist happily. You can find silverberry, pomegranate, Japanese wine berry, apricot, apple, pear, plum and edible hawthorn, to name but a few of the plants they cultivate. I love visiting the garden at Open Garden Squares Weekend, as there are always cuttings and roots of weird and wonderful plants you can buy and grow to surprise your taste buds. Alara has been reaching out to other neglected plots in the vicinity. They have successfully cultivated vines, which have produced enough grapes for their first wine – Château King's Cross, of course. They have persuaded the London Waste Centre to leave compost on site so it can be easily collected by local people for their gardens. Fruit orchards pop up on scraps of land by the road, and they have plans in 2015 to resite their beehives, introduce chickens and build an anaerobic digester. All part of their inspiring vision for sustainability. And, last but not least, whom did I meet at the wassail party but the Events Manager and Marketing Co-ordinator from Duck Island Cottage, who simply couldn’t resist a visit to a garden? 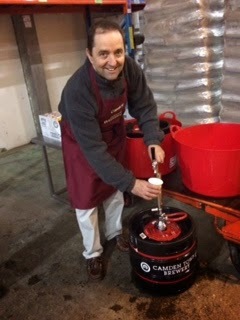 Here they are having fun – and here is the wonderful Alex Smith, pulling a well-earned pint. Alara Permaculture Forest Garden is well worth the long trek up from St Pancras on June 13th and 14th. 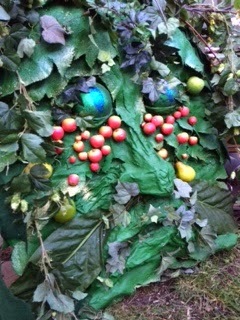 Our handmade green man finally gets the attention he deserves! HI I think your blog is a great idea - it helps keep the excitement going and as its impossible to see all gardens in the one Open weekend, helps give an insight into them. 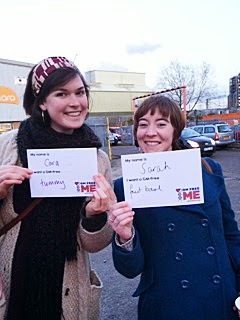 From a work perspective, Fields in Trust protects recreational spaces across London (and the UK). Many of the gardens don't meet our criteria as they are not publicly accessible but some are. If you were to visit these, say, Culpeper Community Garden N1 for example, it would be great if you could mention they are protected forever by us. Also if you let us know that you've visited them, or have written a blog featuring them, we'd be happy to spread the word about your blogpost.